Today marks the 8th anniversary since the last federal increase in the minimum wage. Since then and since the publication of my original blog post on this issue, several states passed legislation to increase their minimum pay, joining the 29 states and 41 localities with a higher minimum wage than the national rate of $7.25 an hour. The increases are in large part due to the rising momentum of worker movements like @Fightfor15. However, these movements that are still seeking to improve the livelihood of over 41 million low wage workers and 19 million children in the US, had a setback last month with the publication of a new study analyzing the effects of Seattle’s gradual minimum wage hike to $15 an hour. The researchers found that the cost of the increase to low-wage workers outweighed the benefits, claiming that the new, higher wage forced companies to hire fewer workers. Despite concerns over the credibility of the study and despite the fact that these results contradict years of research that found that wage increases benefit working families and have very little effect on employment, this study reinvigorated the debate over the policy with headlines like “New study on the $15 minimum wage has bad news for liberals” and “New Seattle study is a big problem for fans of a higher minimum wage”. Nonetheless, these conclusions are a distraction from the real issue, which is – the federal minimum wage is not a living wage. It is well established that a majority of low wage workers must either work multiple jobs or rely on public assistance in order to live. The original intent of minimum wage, as enacted by the Fair Labor Standards Act of 1938 under Franklin D. Roosevelt, was to protect exploited workers while also combating poverty by ensuring that people who work “earn a decent living“, i.e. a living wage. The minimum wage law is a human rights law but all too often the debate is framed as an economic issue rather than a human rights issue. Since people who earn the current federal minimum wage live in poverty, the debate should never be about whether or not wages increase. It should be about how much wages increase and how to implement these increases in an efficient and equitable way. And, the primary question that should be answered is: should an individual who works 40 hours a week be living in poverty? In May, Senator Bernie Sanders introduced a bill that would over the next 8 years incrementally increase the federal minimum wage to $15 an hour. 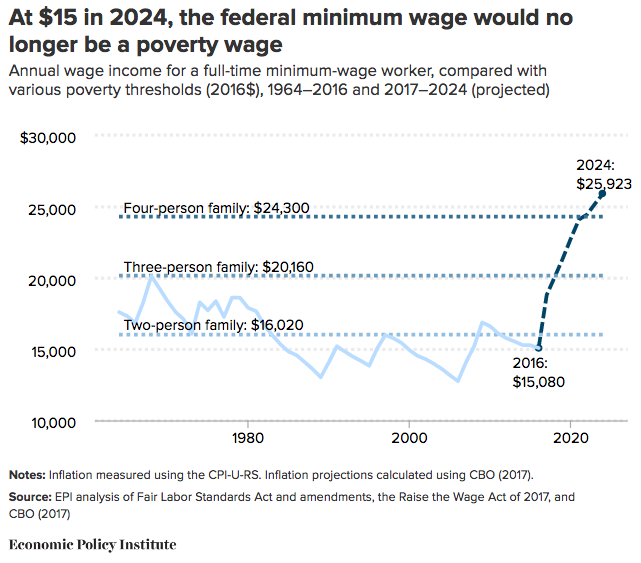 Economists analyzed the bill and calculated that if the wage were to increase to $15 by 2024, it would no longer be a poverty wage. In a country that has experienced historic levels of wealth, perhaps it is time to ensure the minimum wage policy accomplishes what it was initially established to do. How to Get Involved in the Fight for $15? Follow us on @notenoughgood on Twitter and @SISGIGroup on Facebook and Instagram for the next 5 weeks as we discuss everything you need to know about this issue and ways people can become involved to help create sustainable change. We invite individuals with an interest in the subject to chime into the conversation using the hashtag #AlsoSW and join our TweetChat on August 31, 2017 at 3pm EDT where we will hear from experts in social justice and advocacy who will discuss the human rights aspect of minimum wage.